Remember that cool "complete history of Rockstar in artbook form" that we told you about last week? Yeah, nevermind. 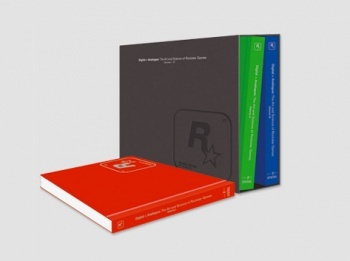 Last week, I wrote about a nifty-looking artbook collection that detailed the entire history of GTA creator Rockstar for the positively negligible price of $450 smackers. For all of you die-hard Rockstar fans out there in the world salivating to plunk your hard-earned moolah down on this baby, though, I have some sad news: It ain't happening. Alexander Galen, VP of Distributed Art Publishers, told Wired that work and plans on Digital + Analogue: The Art and Science of Rockstar Games had been scrapped - and a new project was coagulating in its place. A representative from would-be-publisher Steidl confirmed that the listing had been erroneous. Whatever the new project is, it will also be a book - but beyond that, we don't really know anything. Ah well, I guess you'll have to find something else to do with your spare $450 for the time being.